Why Choose Eagle Woodworking for your Custom Dovetail Drawer Inserts? We are just a phone call away if you would like to discuss any details relating to your order. 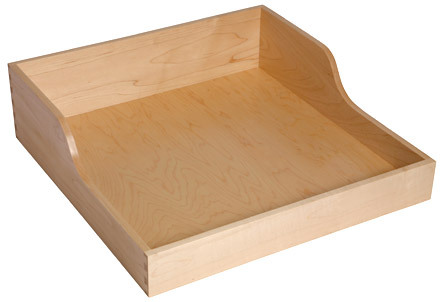 For more than 35 years Eagle Woodworking has built custom dovetail drawers. We take tremendous pride in our work and it shows in the appearance of our products. Your satisfaction is our number one priority, and we strive to ensure you are happy with your order. We make our custom dovetail drawers using only the finest Appalachian clear maple and other selected hardwoods, sourced from some of the nation's most highly-regarded lumber mills. This ensures that our custom made drawers are of superior quality. As for finishes, we apply two coats of protective lacquer to each drawer, with a sanding in between applications. We also offer many finishing options to further enhance the custom look of your drawer, including scooped fronts, shaped sides, cutlery and utensils inserts, file drawers, drawers with dividers, double deck drawers, spice storage, knife storage, trash drawers, bread drawers, u-shaped drawers, corner drawers, and laser engraving. Our reputation is such that our client base spans the United States. Our clients have come to expect the finest custom dovetail drawer available. Each custom dovetail drawer we build at Eagle Woodworking is delivered on time. After all, with 35-plus years in this business, we know how important it is for our clients to receive delivery of our products when and where they need them. At Eagle Woodworking, we are focused on making your drawer buying experience easy and efficient, and we will work with you to ensure a successful outcome to your order.